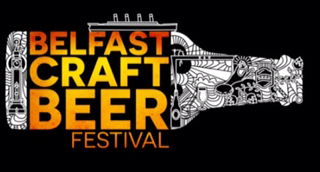 I thought it would be rude not to have a wander over to the Belfast craft beer festival, as it is 2 mins from my office. Belfast used to be a one festival a year town until the last few years. More recently there are three or possibly four beer festivals a year. This was the first time for the Custom House square event and the weather was most definitely on its side. There was a good range of drinks on offer from breweries from the whole of Ireland. Cider and spirits were also available if you fancied something different. Beers that stood out for me were ‘Jack the Lad’ from Reel Deel which is a pale ale. It has a low ABV at 4.5% and tastes great, very seasioanble. ‘Owl Day Pale Stout’ from Trouble Brewing is a very interesting beer. It tastes like a stout but looks like an ale, your head can’t compute for the first few sips. I’m not sure how it’s made but I’m sure it has a bit of chocolate malt in there somewhere. It is a lovely beer and the first of this type I have tried. Finally the kettle sour from Kinnegar which was my first drink of the night. It was really refreshing and not as mouth puckering as some sours. I found myself craving another once I was close to the bottom of the glass, perfect for the sunny evening. The food options available were of a really high standard, I really enjoyed the cheese board that I shared with a friend. I have it on good authority that the burgers were top notch also. It’s really good to see that food standards and quality were high on the list for the organisers as so often they are I feel an after thought. The venue was good, I’m not sure how it would have coped with heavy rain or wind. However it worked really well this year and I hope the organisers plan to run it again next year. I would highly recommend a visit if it is run again.